I have created a survey for my Rincon Hill residential neighbors to get a sense of what people are thinking thus far about the proposed homeless shelter at Seawall Lot 330. 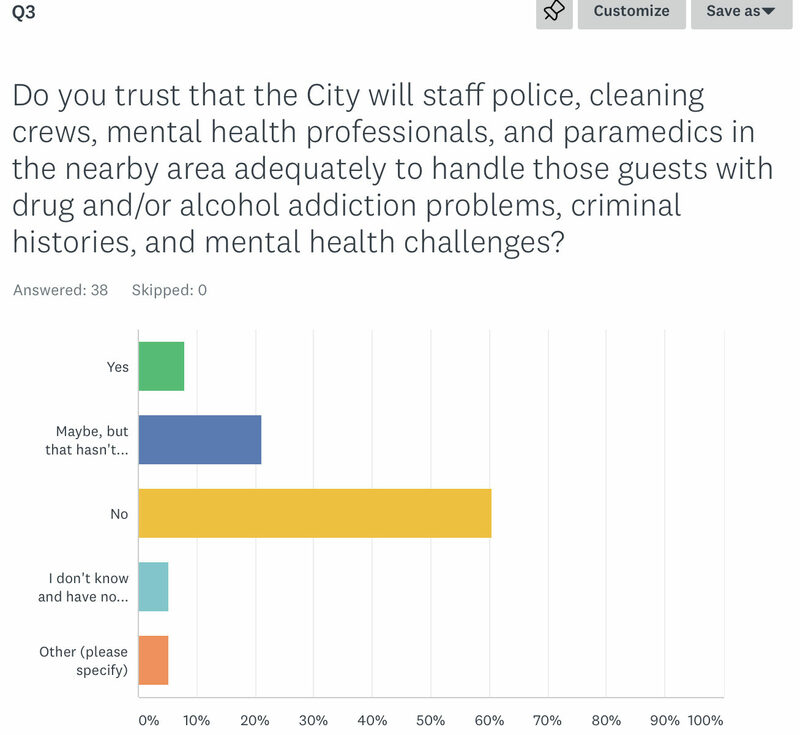 The early results indicate empathy for providing people needed shelter, but fears that the City is not up to the task of adequately staffing up police, cleaning crews, and other services to help make the proposed center a success that does not harm the SoMa waterfront community. 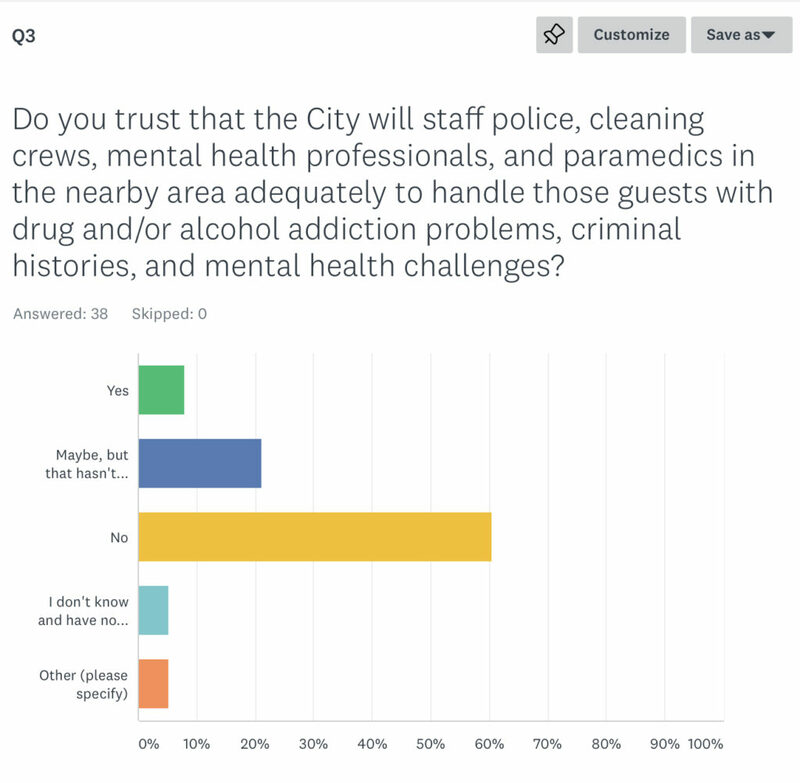 The fact that the City has already resigned their ability to adequately provide security, cleaning, and other basic City government services in SoMa by way of promoting the creation of Community Benefit Districts primarily in SoMa and downtown bolsters this distrust. 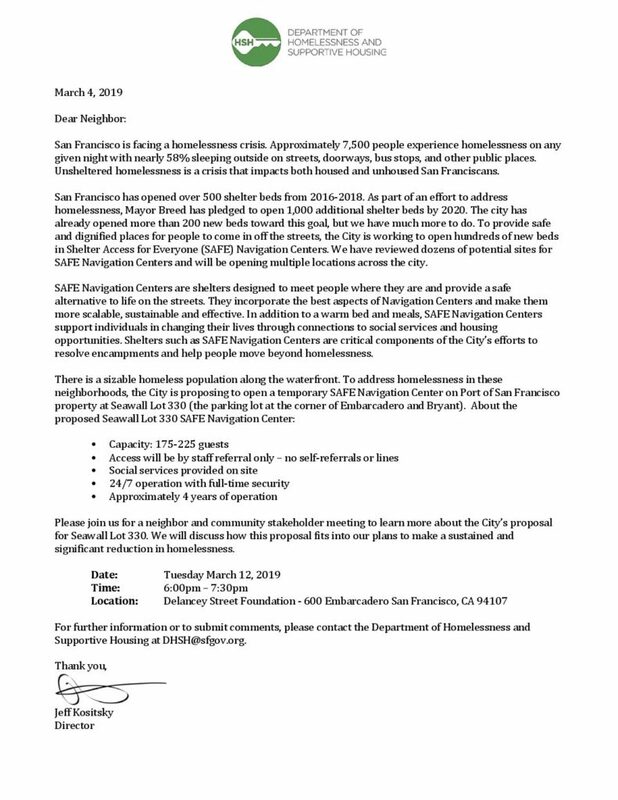 3/10/2019 10:50am edit: There is also a meeting where this proposal will be introduced at the Port of San Francisco earlier on Tuesday, March 12, 2019 starting at 3:15pm at the Port Commission Meeting, Ferry Building, 2nd floor, Port Commission Hearing Room (enter via center stairway or elevator via security office to the left of the stairway). Public comment is taken at Port Commission meetings. San Francisco is facing a homelessness crisis. Approximately 7,500 people experience homelessness on any given night with nearly 58% sleeping outside on streets, doorways, bus stops, and other public places. Unsheltered homelessness is a crisis that impacts both housed and unhoused San Franciscans. San Francisco has opened over 500 shelter beds from 2016-2018. As part of an effort to address homelessness, Mayor Breed has pledged to open 1,000 additional shelter beds by 2020. The city has already opened more than 200 new beds toward this goal, but we have much more to do. To provide safe and dignified places for people to come in off the streets, the City is working to open hundreds of new beds in Shelter Access for Everyone (SAFE) Navigation Centers. We have reviewed dozens of potential sites for SAFE Navigation Centers and will be opening multiple locations across the city. SAFE Navigation Centers are shelters designed to meet people where they are and provide a safe alternative to life on the streets. They incorporate the best aspects of Navigation Centers and make them more scalable, sustainable and effective. In addition to a warm bed and meals, SAFE Navigation Centers support individuals in changing their lives through connections to social services and housing opportunities. Shelters such as SAFE Navigation Centers are critical components of the City’s efforts to resolve encampments and help people move beyond homelessness. Please join us for a neighbor and community stakeholder meeting to learn more about the City’s proposal for Seawall Lot 330. We will discuss how this proposal fits into our plans to make a sustained and significant reduction in homelessness. For further information or to submit comments, please contact the Department of Homelessness and Supportive Housing at DHSH@sfgov.org.